Teahouse, a masterpiece written by Chinese novelist and dramatist Lao She, has been adapted into an immersive, bilingual play and staged recently in New York City by the Princeton Chinese Theatre (PCT). The play, which premiered at the weekend in New York City, explores the vicissitudes of modern Chinese society in one special venue -- a small teahouse. About a third of the audience were invited to be seated with the performers on the stage, acting as guests of the teahouse, talking with supporting characters, and being truly immersed in the play. 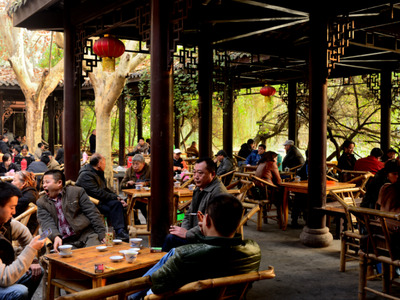 Changshuo Liu, director of the play, told Xinhua that PCT selected and adapted Teahouse into an immersive, bilingual play because the story happened during a time when there was strong collision of eastern and western culture. "We can see many characters in the play were influenced by western culture," and "we were able to include English lines in the play appropriately" to reflect their dispositions and to allow more English-speaking audience to enjoy the show, said Liu, a student at the Department of Mathematics, Princeton University. Jointly presented by PCT, China Institute, and Future China Initiative at Columbia University, the play not only enables Chinese audiences in New York City to renew their memories about their home country, but also introduces the Chinese masterpiece to foreign audience. All cast members of Teahouse are from Princeton University or Princeton community, with most of them Princeton students enthusiastic about drama. The play offers a wonderful opportunity for them to access Chinese culture and literature. "It was fun when we rehearse the play, as we said we welcome all ethnicity background when we recruit members...We have been flexible in casting, (no matter they are) Asian Americans or internationals. Even though some of them are not so good at Chinese, I'm not so good at English, we are compatibly working together," Liu said with excitement. "PCT will stage more plays like this with bilingual lines to make sure that the audience with different background understand and accept," said Liu, adding that "the content will be based on Chinese culture." The play is also in commemoration of the 120th anniversary of the Chinese literary master Lao She's birth.